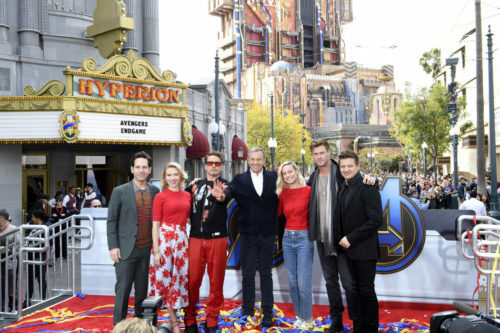 ANAHEIM–(PRNewswire)–The stars of “Avengers: Endgame” Saturday visited the Disneyland Resort to launch Avengers Universe Unites, a charity event that supports The Walt Disney Company’s signature philanthropic commitment, Disney Team of Heroes, which delivers comfort and inspiration to seriously ill children around the world. Robert Downey Jr., Chris Hemsworth, Scarlett Johansson, Jeremy Renner, Paul Rudd and Brie Larson were on hand at Disney California Adventure Park to celebrate the donation of more than $5 million to nonprofits supporting children with critical illnesses, including $1 million in cash from Disney to Starlight Children’s Foundation. The LEGO Group, Hasbro, Funko and Amazon together donated over $4 million in “Avengers: Endgame” toys and products which will be sent to hundreds of children’s hospitals throughout the country, as well as Give Kids the World, a nonprofit resort in central Florida. The Avengers stars joined kids from the Boys & Girls Clubs of Anaheim and Garden Grove to play at a larger-than-life LEGO build at The LEGO Store in Downtown Disney and were treated to a visit by Amazon’s Treasure Truck stocked with Avengers: Endgame toys., including Hasbro action figures, Iron Man MK50 robots by UBTECH and Funko POP! vinyl figures.